It was hard to decide—in Loring Park, the trio Soul Café was performing the music of Miles Davis in tandem with the poetry of Robert Bly, with Bly himself reading. Down the street, maverick cellist Matt Haimovitz was performing a mostly classical program that included a suite based on Shakespeare and another based on the words of Mark Twain. 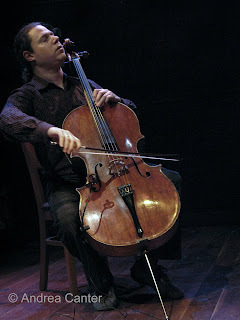 Modern classical cello on a jazz club stage won out. I am really sorry I missed this special Soul Café evening. I am not the least bit sorry I spent the evening with Matt Haimovitz. Haimovitz opened with Bach’s "Suite for Cello in G Major." This is music written to be performed in intimate surroundings, the grand parlors of royalty. The Dakota may not be so opulent but certainly the acoustics surpass any Bach imagined. And performed on solo cello, viewed from a vantage point of only six feet, surely is the way Bach envisioned it. Even the Dakota’s normally low level of chatter was absent, and hardly a fork tine clinked. Haimovitz, only 36, is a virtuoso on any scale, but his “bring it to the people” presentation will be his legacy. He’s as likely to be found in a bar, night club or outdoor festival as in a concert hall; when he comes to town (as he seems to do here annually), he leads master classes and performs with local chamber groups in addition to his pilgrimage to the Dakota, where he draws a sell-out crowd of folks who are as likely to love Miles and Coltrane as Bach and Mozart. The centerpiece of the two-set program tonight was Ned Rorem’s suite, “After Reading Shakespeare,” nine movements, each introduced by Haimovitz’ reading of Rorem’s selected quote from the Bard’s plays (Lear, Tempest, Othello) and sonnets, including a snippet of a stage direction from A Midsummer’s Night Dream. To set the stage, so to speak, Haimovitz closed the first set with his commission of a companion piece by Paul Moravec, “Mark Twain Sez,” a suite whose segments were introduced with lines from Mark Twain. There’s a third suite, also commissioned by Haimovitz and composed by Lewis Spratlan (“Shadow”), inspired by the works of Rambo/Rimbaud. Together the three suites appear on the cellist recent release, After Reading Shakespeare. Although his liberal (some say controversial) interpretations of classical repertoire are his hallmark, Haimovitz is a musician of the 21st century and gains inspiration from modern culture. After Bach and Rorem, he next tackled Jimi Hendrix with his arrangement of “Star Spangled Banner” (or more accurately, “mangled”), returning with an Allemande from another Bach suite for his encore. Somehow it all seemed to flow, placing Bach and Rock on a single spectrum. 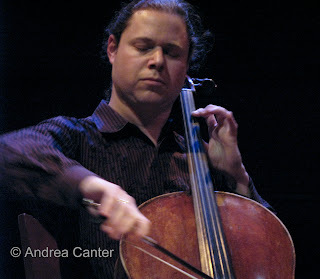 Haimovitz, regardless of repertoire, coaxes as many sounds from his cello as does the best jazz bassist. His left hand is as graceful as any in music, and his bow can ignite with a furious staccato or soothe with a liquid legato. His elongated glissando pushed notes right off the staff, and you had to watch very carefully to identify the source (left hand or right?) of many pizzicato plunks. Haimovitz must be seen as well as heard. Why not hold classical recitals in unlikely spaces like jazz clubs or cafes? Why separate the music from the listener with cold stages and aisles of theater seating? Why not talk about the music along the way? Present classical music in such informal intimacy on a routine basis and watch record sales soar. Bring new audiences into jazz clubs… and it won’t hurt jazz, either.